Talking with body, mind, emotions and spirit SIMULTANEOUSLY works! Your MIND knows how to protect and defend your well hidden issues kept in denial for years! Because we believe that it may be too painful, or uncomfortable, to deal with stories of neglect, abuse, trauma of any kind, or simply nagging discomfort, we build a wall and cut ourself off from inner healing resources. The mind is given the job to protect you and keep these walls in place, so just talking about your problems most often won't get to the core issues and continues your mind-games. Your BODY protects you by hiding the pain and covering it up through addiction, entertainment, substance abuse, internet, excessive power exercises of any kind. ....Bodywork by itself is great and can help, but is focused on the body as just one component. Your EMOTIONS learn to pretend that nothing is wrong, we stuff the pain and force ourself to move on, or live in codependent relationships, or look for 'fast food therapies' to deal with the moment, until it no longer gives relief. Your SPIRIT is neglected, so you try workshops, mindfulness, yoga, etc. all wonderful, except it may still continue to be hard to leave redundant body-mind patterns and connect to a 'deeper and higher self'. What if your mind can no longer keep up with hiding from what needs your attention ? What if the body cries out in pain, or even disease, anyway? What if your emotions keep you on a roller coaster and you get triggered all over the place ? What if your spirit keeps nudging you to learn deeper from yourself, ...that God, Goddess, or however you like to relate to your larger Essential Self, is not outside but inside of you, waiting patiently to be discovered. If you like to experience how it all works together combining "talking and listening" TOUCH, BODY-TALK and CORE MOVEMENT based on three ingeniously designed modalities, then try Unergi (unity & energy) Body Psychotherapy with me. Over 35 years I have studied, practiced and taught the ALEXANDER technique, GESTALT therapy, and psycho-physical movements based on the work of Moshe FELDENKRAIS, all to integrate MIND, BODY, EMOTIONS and SPIRIT. This work is simple and complex, and it simply works ! Talk to me about an introductory Body-Psychotherapy session. Ute Arnold , UNERGI Body-Psychotherapist, invites you to a UNERGI Body-Psychotherapy Study/Training Group and/or a private session with Ute at her home office in Pt. Pleasant, PA (see private sessions for other locations). Unergi Body-Psychotherapy is a Holistic Therapy method created by Ute Arnold. 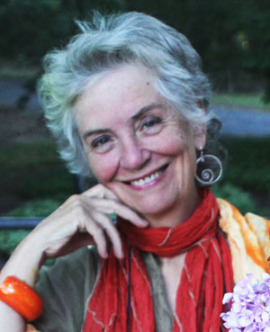 She developed the Unergi Method by integrating touch with the Alexander Technique, talk in the form of Gestalt Therapy, Unergi Core-Support Movement based on the Feldenkrais Technique™ with creativity and the Healing Forces of Nature. Unergi creates Emotional and Sensory Intelligence, simultaneously releasing deeply buried memories and building Core Support. The Unergi Body-Psychotherapist skillfully listens to and amplifies the voices of the body through touch, talk and gentle psycho-physical movements. Any interference that resides in your personal history -- may it be of physical or emotional suffering -- safely transforms into freedom of natural creative expression and action. Relationships with self and others move toward insight and balance. Ute also offers private sessions at her home office in Pt. Pleasant, PA, and in Lambertville and Princeton, NJ.